On an enjoyable evening before Japan played Belgium in the early hours of the following morning, booze was had and belief was bolstered. The post-game hurt and hangovers, however, were presumably much less fun. That’s an unusually clean-looking and well-lit bar, compared to your usual haunts. Yes, although I’m happy to report that it did have a few, suitably grubby little spots! There again, England are still in with a shout, so it’s not all bad news by any stretch of the imagination! Nice photograph. It really captures the atmosphere. That really was one of the most entertaining matches of the tournament so far (including England’s last night). And even though Japan lost, they lost to a great goal and showed the world what they are capable of. Thanks. Yeah, Japan were a really big surprise. A loss, but a good one if there is such a thing. For me it’s been France up to now as far as entertainment goes, but obviously the England game was special. Getting up at 3am to watch it on the other hand wasn’t that special. Thankfully the next game starts at a much more reasonable 11pm. A time much more appropriate for enjoying a few beers as well. 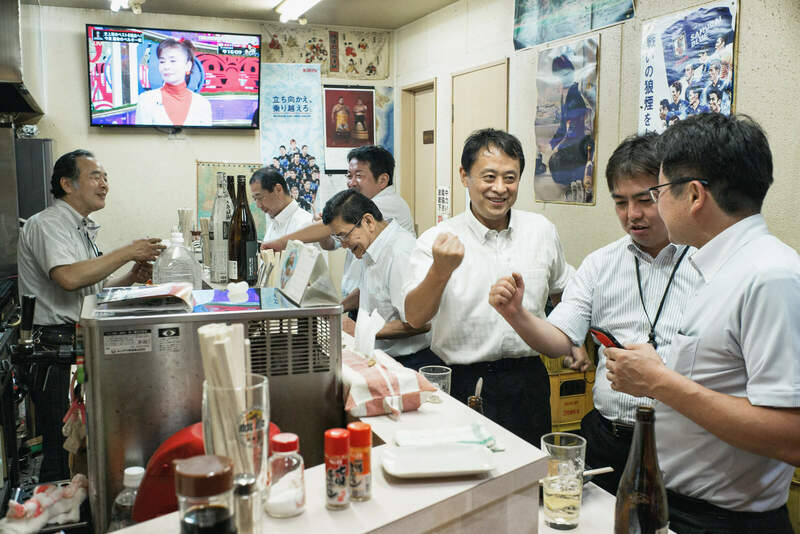 This picture seems to capture the Japanese ossan salaryman so well. Everything. Thanks a lot. The light shirts and dark trousers appealed at first, then when they started the fist pumping, I knew that was the moment!